Let your stay on Navarre Beach be full of "SeaRenity". 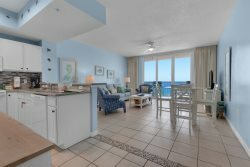 This 3 bedroom, 3 bathroom, beach front condo, is located on the 3rd floor of the Summerwind Resort. With it sleeping up to 10 people, it is perfect for the whole family and even a few friends! Located in the Center building, you will have breathtaking views of the emerald coast and Navarre Beach Fishing Pier from your wrap around corner balcony. The master bedroom features a King bed as well as a private bathroom with a Jacuzzi tub. The two guest rooms feature 2 full beds and a queen bed. The updated kitchen is fully stocked and the perfect place to enjoy a meal with the whole family. Call today to enjoy some "SeaRenity" on Navarre Beach. This was our second year to stay at a Navarre property. It is beautiful and we love the location. Working with the team members were great. I had to call maintenance because the air conditioning was not working. The maintenance man was at my door before I got back to the room. However, the air conditioner never got fixed. My stay was great. It would have been a lot better if the air conditioner was working. It was cooler outside than inside which made it very uncomfortable to sleep at night, especially for my 1 year old.